Turn on any television channel that focuses on travel or exploration in the month of October and there’s a great chance you’ll find yourself in the middle of a paranormal case involving investigators, a cranky ghost or two and some awesome sound equipment. The paranormal investigation obsession has kept TVs humming for longer than you might think. The first supernatural stories were shown on news stations back in the 1960’s and the genre has been especially busy over the last nearly two decades, as series like Ghost Adventures and Ghost Hunters have earned a loyal fan base thanks in large part to their charismatic hosts, eerie settings and elaborate use of technology during their investigations. Of course, searching for contact from the other side has been a fascination to mankind for centuries. Documented research stretches back to the 18th century. Considered one of the first books on the subject of communication with the dead, Communication with the Other Side was published in 1760. 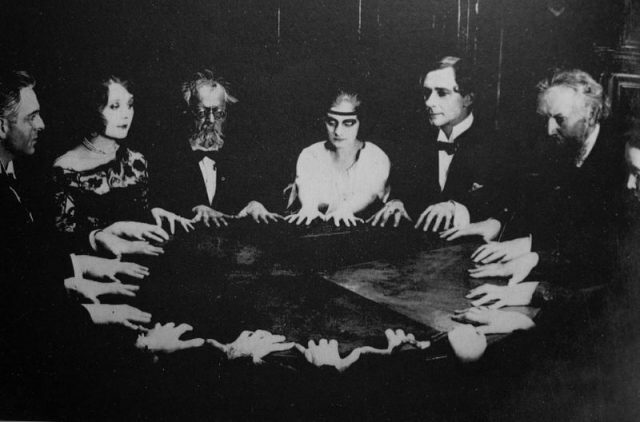 As interest grew, folks started getting together and holding seances. Instruments used in these sessions included everything from candles, water and spirit boards (Ouija boards) to trumpets (yep) and chalk. While many people did (and still do) believe, there are just as many who don’t. One of the most famous skeptics was none other than famed magician Harry Houdini. The man-made a career of exposing fraudulent acts and believed mediums and psychics to be just that – nothing more than an act. Houdini would often attend seances in disguise and then lay the hammer down when things got too fishy. Houdini would go on to write a book about his debunking called A Magician Among the Spirits, which led to him and good friend Arthur Conan Doyle having a nasty public falling out. Doyle believed that Houdini used the power of the other side to complete some of his tricks. Houdini also hired H.P. Lovecraft to pen a book about debunking the spiritual craze and while Lovecraft did in fact begin writing the book, Houdini’s death put an end to the project. 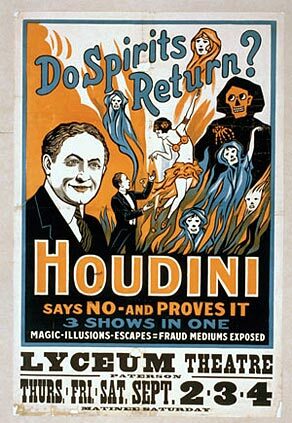 For his part, Houdini did quite a bit of good, too, even though he wasn’t seen in a good light by many free thinking folks. He squashed several real fakers, including well-regarded mediums and he also opened the public’s eyes to how easy it was to create some of the tricks of the eye and mind that mediums used to make things such as spiritual photography. Another renowned medium debunker was Harry Price, who quickly became arguably the first and most famous ghost hunter ever. Price did not have an easy go at becoming a well-known man, mostly due to his personality that clashed with scientists and fellow mediums at the time. Price was also an outspoken self-promoter and that didn’t do him any favors, either. In fact, many thought of his as an embarrassment to the established science field and while his work is regarded as very ahead of its time posthumously, Price still has his skeptics. Price was also an amateur inventor who used many of his handmade devices during his paranormal investigations. He formed the National Laboratory for Psychical Research in 1923 and in 1929, Price became the face of paranormal investigations. He investigated the famed haunted house Borley Rectory in Essex and he laid claim to some of the most convincing – and debated – paranormal investigative documents ever written. These days, the flamboyant personality of Price and the fierce determination of Houdini live on in the paranormal research world. While not every investigator has the small screen at their disposal, those who do have made the most of it. It’s hard to go into any metropolitan area these days and not find a paranormal society based there. There are conventions such as the Haunted America Conference all across the country and the aforementioned TV stars like Zak Bagans are as big of reality show celebrities as anyone. Ghost hunting and paranormal investigations aren’t going anywhere any time soon. While we may not agree with all of the practices done by these researchers, we can all agree on one thing – it’s fascinating stuff. 23 days until Halloween: DIY light up the night! ← 32 Days of Halloween: Did you know?